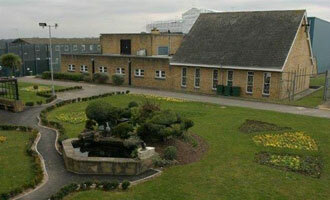 The prison opened in 1989 as a category C Male Prison, converted from the former nurses' home of Banstead Hospital. In September 2001 Downview re-roled to a closed prison for adult women and in December 2004 a 16 bed juvenile unit (The Josephine Butler Unit) opened for young female offenders, this was then closed in 2013 following a national review of the female estate. In 2013 Downview closed for refurbishment and opened again in May 2016 continuing as a closed female establishment. The establishment is currently in the process of building up its population. Accommodation: Single cell accommodation with in-cell electricity. 5 Wings (A, B, C, D & E), all wings have in-cell electricity. D & E wings are currently out of use, when it opens D wing will serve as a resettlement unit, the function of E wing is currently being determined. There is also a Segregation unit on site. HMP Downview is on the London Borough of Sutton / Surrey border close to the M25 and M23 and with good links to Sutton railway station. Since being absorbed into the Greater London Region. The characteristics of the population are varied and diverse with the majority of our prisoners originating from the London area or the South East of England. There are clear links between the qualifications offered in the prison and the various progression routes to employment made available via Resettlement and National Careers Service. The curriculum and training offer from August 2016 will include: Catering, Business Administration, Beauty Therapy, Hairdressing, Customer Services, Functional Skills, ITQ, ESOL, peer mentoring, property maintenance and horticulture. All courses lead to nationally accredited qualifications. We are developing our provision through partnerships with the London College of Fashion, Max Speilman Academy (specialists in reprographics), and a production kitchen with the Clink to improve employability and potential to gain qualifications. Opportunities will develop further with work and training places in the community, linked to our provision and as our population increases and based on the diverse needs and interests of the population. It is also anticipated that the TSP (OBP) Course will be introduced later this year. Our developed gymnasium facilities including a full length astro - turf football field forms a key part of the promotion and development of health and well-being. Healthcare is commissioned by NHS England (South) and provided by a number of specialist healthcare providers. Primary care and mental health staff are provided by Central North West London NHS Trust and are on site every day of the week. Primary care staff will provide services similar to those provided in a GP Surgery and we offer access to screening programmes, health living information and immunisations. The mental health services can offer a range of interventions which may be a brief conversation to signpost to services, therapy, psychosocial interventions, community mental health team case management and possible referral to more intensive services. Substance Misuse services are provided by Addiction and RAPT and are on site seven days a week. Substance misuse maintenance and detoxification are available alongside psychosocial support. GP services are provided by Cheam Family practice who are based locally and work across many other prison sites. We do not provide access to 24 hour healthcare, therefore no inpatient beds. Women felt to need this level of input may be transferred to other establishments.